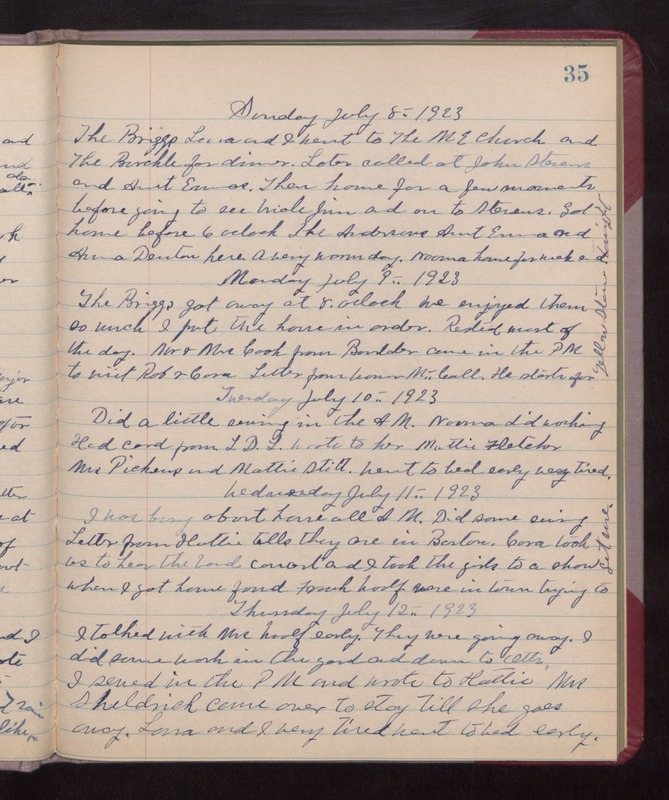 Sunday July 8th 1923 The Briggs Laura and I went to The M E Church and The Burchle for dinner. Later called at John Stevens and Aunt Emmas. Then home for a few moments before going to see Uncle Jim and on to Stevens. Got home before 6 oclock. The Andersons, Aunt Emma and Anna Denton here. A very warm day. Norma home for week end. Monday July 9th 1923 The Briggs got away at 8 oclock. We enjoyed them so much. I put the house in order. Rested most of the day. Mr & Mrs Cook from Boulder came in the PM to visit Rob & Cora. Letter from Warner McCall. He starts for Yellowstone. Tuesday July 10th 1923 Did a little sewing in the AM. Norma did washing. Had card from L D L. Wrote to her. Mattie Fletcher, Mrs Pickens and Mattie Stitt. went to bed early. very tired. Wednesday July 11th 1923 I was busy about house all AM. Did some sewing. Letter from Hattie tells they are in Boston. Cora took us to hear the band concert and I took the girls to a show. When I got home found Frank Woolf were in town trying to get [me?]. Thursday July 12th 1923 I talked with Mrs Woolf early. They were going away. I did some work in the yard and down to Otts. I sewed in the PM and wrote to Hattie. Mrs Sheldrick came over to stay till she goes away. Laura and I very tired went to bed early.